When we visited the Makgadikgadi National Park, we had to leave one of the jeeps on the other side of the river and canoe over to where the guide had another jeep. 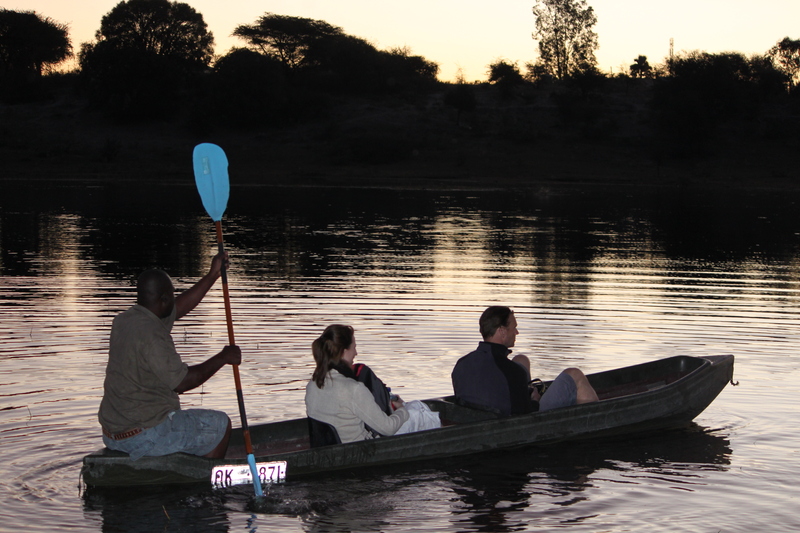 This photo was taken after the safari and our group took turns going back across the water to return to the camp for dinner. This entry was posted in Africa, Travel Photos and tagged Africa, Botswana, Canoe, Makgadikgadi National Park, Photography, Safari, Travel, Travel Journal, Travel Photo, Travel Photos. Bookmark the permalink. Looks like fun! In my mind I picture crocodiles in the river and on the banks. Did you see any? You have had so many interesting experiences! I am glad you share them with us. That would have been a lot of fun… as long as there are no hippos near by. Or crocodiles. I don’t know which one scares me more. I will always remember it. The hippos were the most terrifying for me…they are so large and when you see them up close you see all of their battle scares. They are fierce creatures and I would be no match. Ah that lovely afternoon/evening light in Africa! I’ll be in Botswana in late May but won’t see Makhagikhagi. Thanks for this! Have fun and I’m so jealous! It is a wonderful country. Thanks! I’ll probably post a few photos on my Facebook page if I have a chance. I’ll be visiting my favorite elephants while there! Great photo! They look at ease in the boat, but I would be nervous about crocodiles. Oh I was…it is odd since I enjoyed my trip so much, but there was always a little fear in the back of my mind. The canoe ride was quite peaceful…and all of us made it safe and sound. Wow! I will have to pick your brains before I plan a trip to Africa! Please…I love talking about it!